As her 'rath' inched through major thoroughfares, enthusiastic people and party members took vantage positions to click a prized photo. 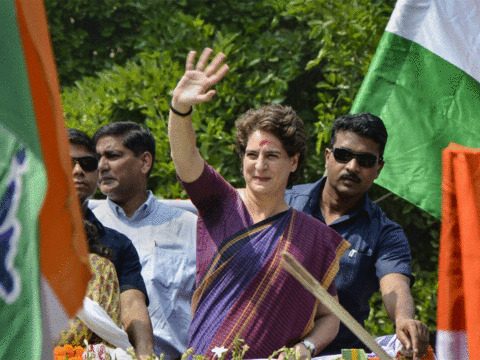 LUCKNOW: Making her political debut as Congress general secretary, Priyanka Gandhi on Monday roared into Uttar Pradesh with thousands cheering as her cavalcade slowly made its way through the city during a roadshow, being seen as launch of the party's campaign in the state ahead of the Lok Sabha polls. Accompanied by Congress president Rahul Gandhi and incharge of the western region, Jyotiraditya Scindia, the beaming 47-year-old sported a kurta and a stole, and waved at the teeming party workers jostling for a glimpse. 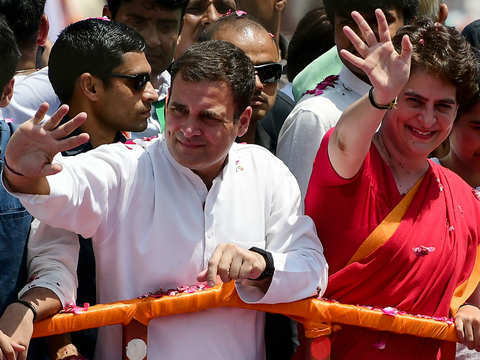 When the three leaders embarked on a roughly 25-km-long roadshow, from the airport to the party headquarters, to woo voters in the Lok Sabha polls, rose petals and marigold garlands were showered at their cavalcade. Enthusiastic Congress workers took to the streets to celebrate the arrival of the two new AICC incharges, with party tricolours and hoardings all over giving the city a festive look. Since early morning, Congress workers were seen busy giving final touches to the arrangements for the roadshow, distributing food packets, tea and water to passersby. Patriotic songs were played on loudspeakers perking up the mood. Some posters showed Priyanka in 'Durga Mata' avatar riding on a lion. "Maa Durga ka roop behen Priyankaji (Sister Priyankaji is Maa Durga's incarnation) said one poster, while some others highlighted her resemblance to Indira Gandhi, her grandmother. Besides workers of other front organisations of the party, some Congress workers -- said to be members of Priyanka sena, a little known outfit -- were seen wearing pink T-shirts with her photograph. "With the Priyanka Sena at the Nehru Bhawan, Lucknow it is almost celebration here," tweeted Sushmita Dev, president of all India Mahila Congress. An enthusiastic party general secretary Shailendra Tewari has customised his car to welcome Priyanka with the banner reading, "Aa gai priyanka...baj gaya danka... brashtachar ki ab lagegi Lanka..."
Uttar Pradesh Congress Committee spokesperson Rajiv Bakshi told PTI that Priyanka Gandhi's entry into formal politics will enthuse party workers to regain lost ground in the state in the Lok Sabha polls. 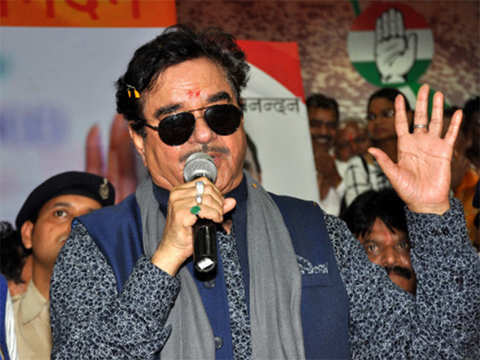 "This is an opportunity for the Congress to strike back in the most crucial state of the country where the organisation had all through been wanting her to plunge into active politics," he said. 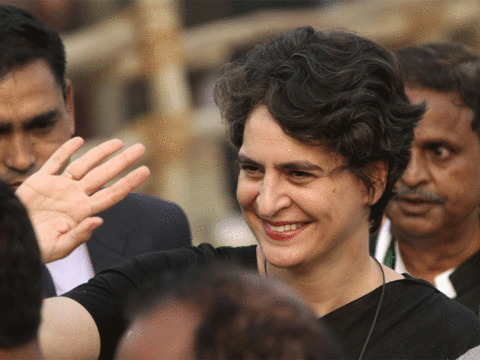 Priyanka Gandhi is the Congress' big hope for the 2019 Lok Sabha elections who will be shouldering the responsibility of reviving Congress fortunes, especially in the eastern part of Uttar Pradesh, say party insiders. Her entry into active politics has been at a time when the party is not only witnessing one of the most difficult times electorally but has also been sidelined by prospective allies for the 'mahagatbandhan' with the Samajwadi Party and BSP totally ignoring it in forming their alliance. 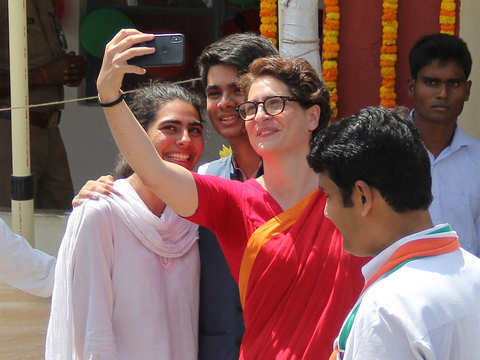 Priyanka Gandhi is pitched as a big draw with her charisma and voter connect, but her 'rescue Congress' mission remains a daunting task in the state where the party has been pushed on the margins with the advent of caste based politics since the last 30 years. 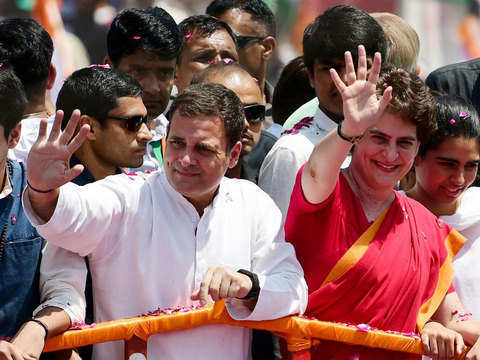 Though she is no stranger to such roadshows with her brother, she is seen campaigning for the first time outside the Gandhi family constituencies of Amethi and Raebareli and her political acumen and connect with the public will be at test for the first time. The last two Lok Sabha by elections in eastern Uttar Pradesh, for the Gorakhpur and Phulpur, were disastrous for the Congress. Party candidates managed to fetch only around 19,000 votes each and registered only a 2 per cent vote share in each constituency. In 2014, the Congress just managed to retain the Gandhi family constituencies of Amethi and Raebareli, as compared to the 21 it had won five years earlier. The party's voteshare also dropped by almost 50 per cent between 2009 and 2014. 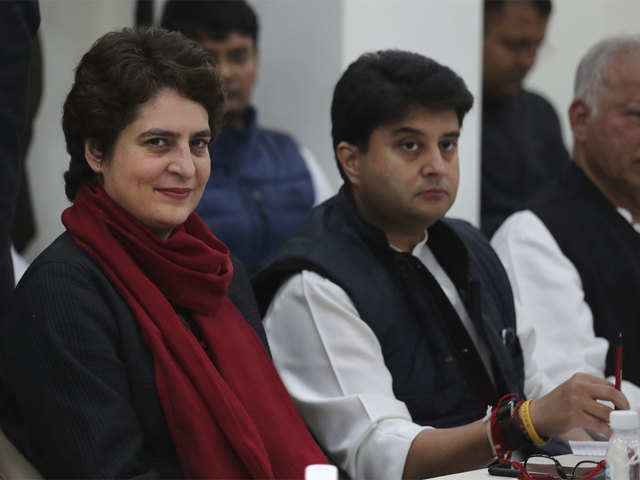 Eastern Uttar Pradesh, the area where Priyanka Gandhi will be active is presently the strongholds of Uttar Pradesh Chief Minister Yogi Adityanath and Prime Minister Narendra Modi. UPCC general secretary Dwijendra Tripathi said making two general secretary incharges of Uttar Pradesh showed the seriousness Rahul Gandhi attaches to state. "Both are young and popular, he said. They have a certain hold over the public and have leadership qualities and a rapport with the common man." 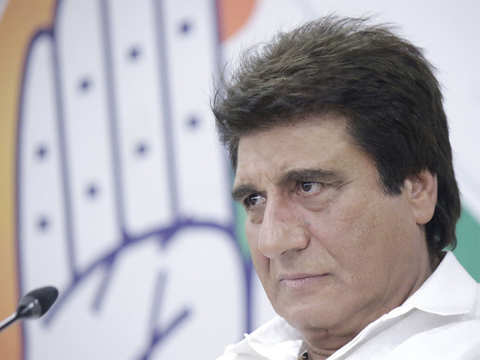 Congress leaders said Priyanka Gandhi's into active party politics will galvanise the workers, helping them take on the dual challenge posed in the state by the BJP and the SP-BSP alliance. Welcoming the new entrants in the party, she asked Congress leaders to ensure the victory of Rahul Gandhi with a big margin. The Congress president refused to “confirm or deny” the query, saying he would let the “suspense” stay. He said that his party, which was reduced to just two seats in the state in the 2014 Lok Sabha polls - Rae Bareli and Amethi - has "not vanished" and will revive. "The type of government (the) country has seen in last five years is well known to the people, people are the best judge," Priyanka said. 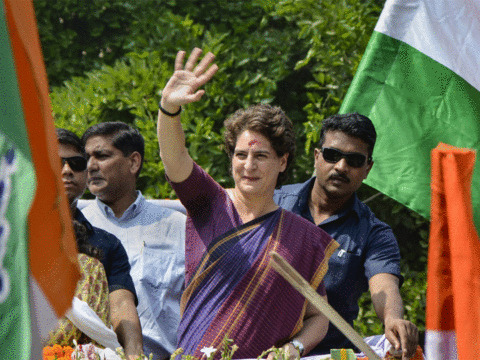 Lok Sabha polls 2019: Will Congress field Priyanka Gandhi from Varanasi? Party sources said internal surveys have been conducted in both Allahabad and Varanasi to assess the Congress’ strength in the seats. Congress members that a list of Lok Sabha constituencies is being prepared where Gandhi would travel to campaign for the party. 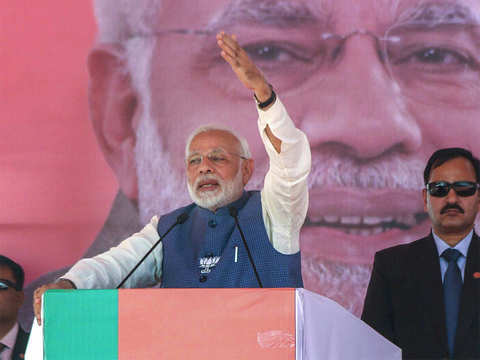 Modi is also focusing on Gujarat in a big way, and will hold five more rallies in Himatnagar, Surendranagar and Anand on April 17, Amreli on April 18 and Patan on April 21. Those coordinating her campaign agree that for brand Priyanka to work, more is needed. Priyanka has so far restricted to campaigning for the party in UP.